Memories by AmyInKy: Halloween in February...??? When I reorganized my scrap space, I came across a few (too many?) 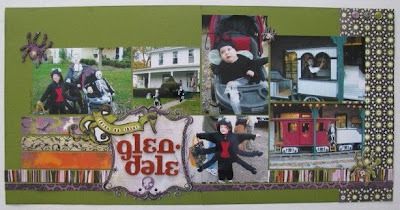 Halloween themed scrapbooking papers/kits. My favorite was the Basic Grey Eerie collection from this past fall. I had purchased individual sheets and some embellishments back when it first came out, but only got so far as to "kit" them together. 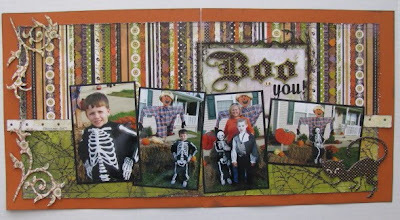 On a recent trip to Archiver's, I found several matching embellishments marked down 50%. I was anxious to use this line! 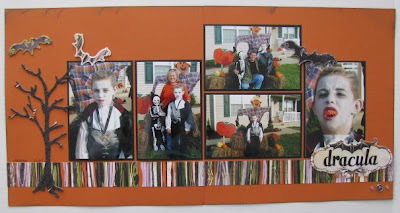 Last night my aunt came over for some late night scrapbooking. 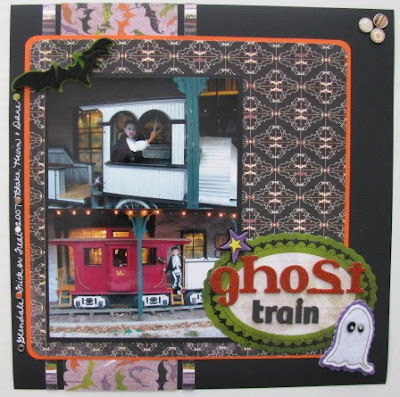 I was inspired by some LOs by Allison Davis (2-pagers) and my new issue of Scrapbook Trends magazine. I was able to finish four layotus last night and another one earlier this afternoon. I LOVE them all. Like I mentioned earlier, I loved Eerie to start with. It was just that much better after adding photos. I started by pulling out my 2007 Halloween photos. This was a year where the boys costumes didn't really coordinate. Kevin really wanted to be a skeleton, so he used an old costume of Blake's. It was deja vu seeing him look much like Blake - like a yard decoration - during our photo shoot in the front yard. He was adorable when he took the mask off though. "Boo to You!" was inspired by a LO in the February issue of Scrapbook Trends by Lisa Dickinson. Although I feel like I could scrap all night, I'm declaring tonight movie night with my husband. I will admit though that I'm keeping my fingers crossed for the snow they are predicting for Monday night to hit. Big. I'd enjoy a snow day filled with scrapping in between making batches of hot cocoa for my boys. These are wonderful! I loved this line too! Great job! Awesome LO's Amy!! I love what you did with this line!! Halloween is not my best subject to scrap but you make it look so easy! These are just gorgeous Amy. You are SUCH an inspiration. They all came out amazing! I cant believe you still had so many good pics layin around! Cute LO's... lovin' the 2-pagers! Very cute! What movie did you watch over the weekend? Oh & we have plenty of snow... if only I could share some with you!